We grew up calling this dish “Каша” (Kasha) meaning porridge. 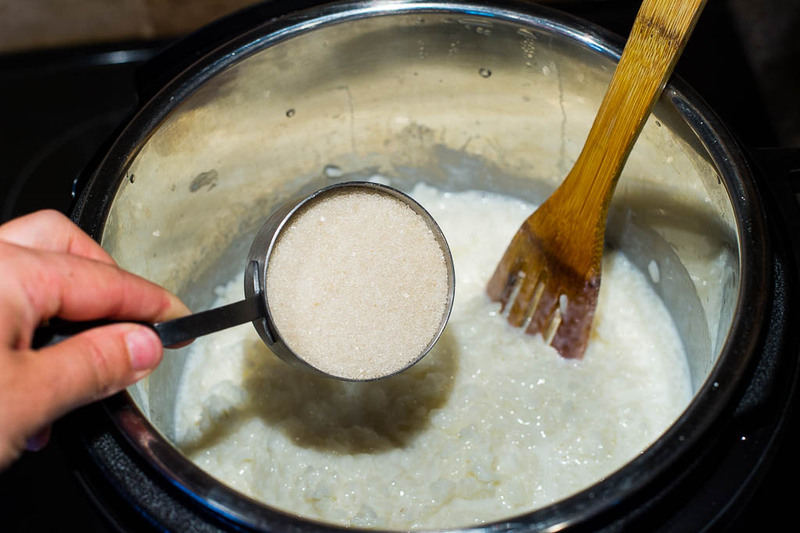 My kids call it Rice Kasha, since we have several other porridges made with milk or water. 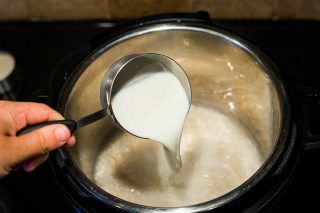 A conventional method of making rice pudding involves a lot of mixing, adding more liquid and constantly watching the stove (Running milk, you know what I mean?). While it is still a skill you would want to master, why not take shortcuts when you can? This is a foolproof recipe using the Instant Pot, if you follow it to the T. I will list all the nuances that you will need to know while cooking rice pudding either on your Instant Pot or your pressure cooker. Choosing rice for rice pudding is important. Different cultures might use different rice. 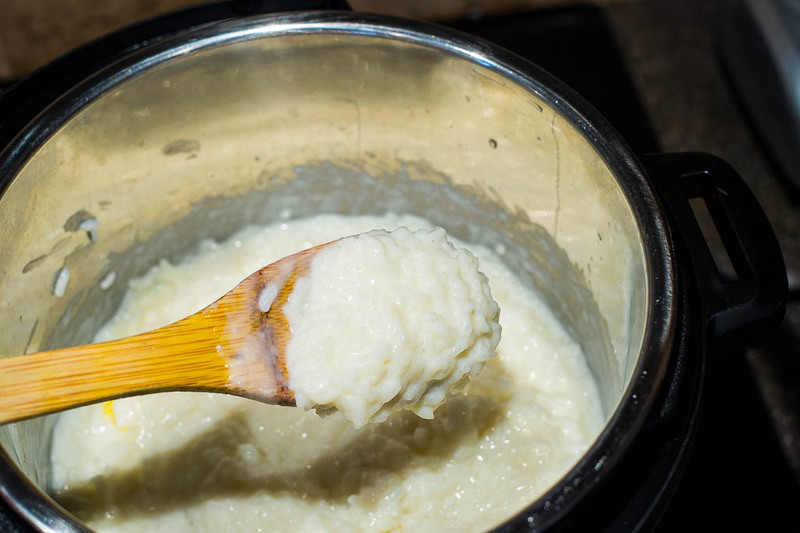 However, to get that creamy, soft texture for the rice pudding, you need to choose rice which will soak up enough liquid and soften. I personally use Calrose (California Rose) for my rice pudding. 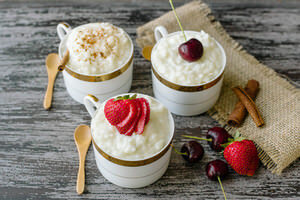 Calrose is also labeled as Botan and is widely available throughout the U.S. Also, the texture of the rice pudding is created with adding an adequate amount of fats. 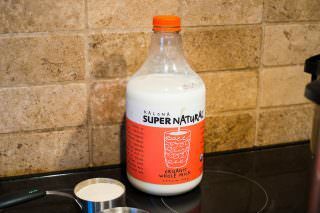 Be it in the shape of whole milk, and/or butter. 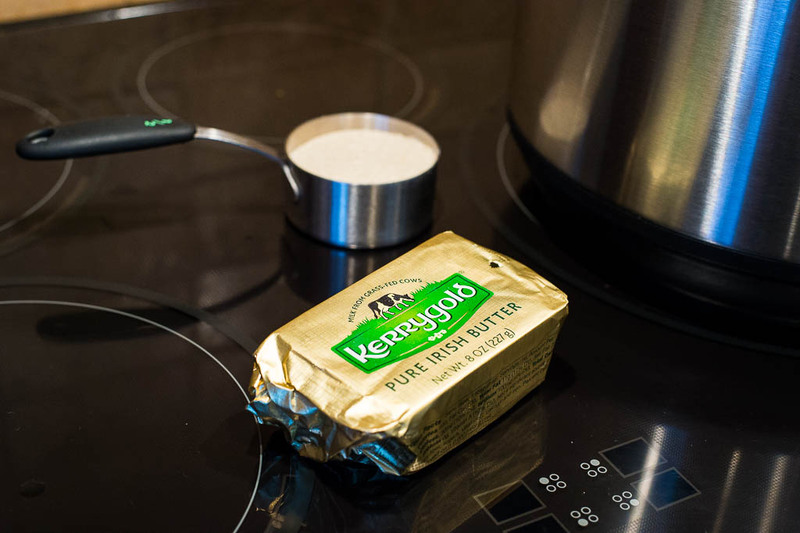 I use whole milk and I also use Kerrygold butter. Essentially, rice pudding is a 5 ingredient porridge. If you would like to add spices like nutmeg, cinnamon, or ingredients like dried berries, be my guest. This is not a DIETARY food. I repeat, this is not a dietary food :D It is a comfort food nonetheless. It packs 401 cals per serving, which isn’t too bad, considering it is very filling. It will do to fulfill your sweet tooth, though. 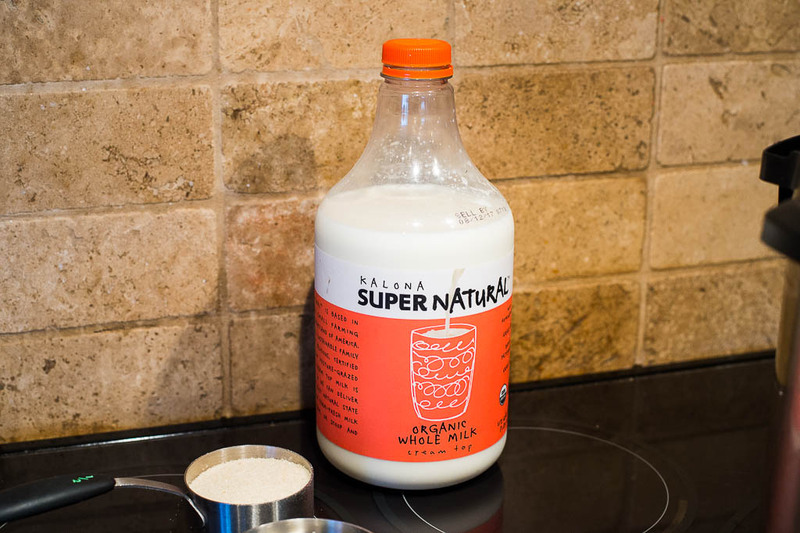 At 26 grams of sugar, it better! optional additions: Cinnamon, nutmeg, dried berries, etc. 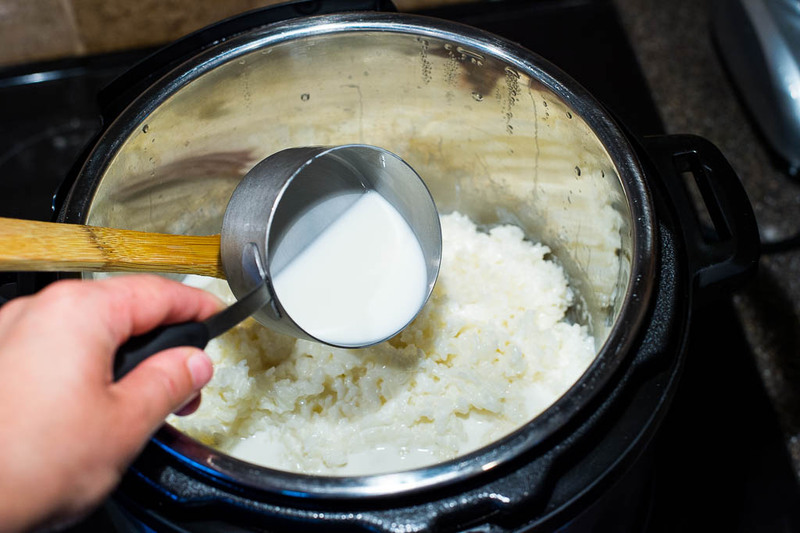 Place 2 cups of rice in a medium bowl and wash it three times. 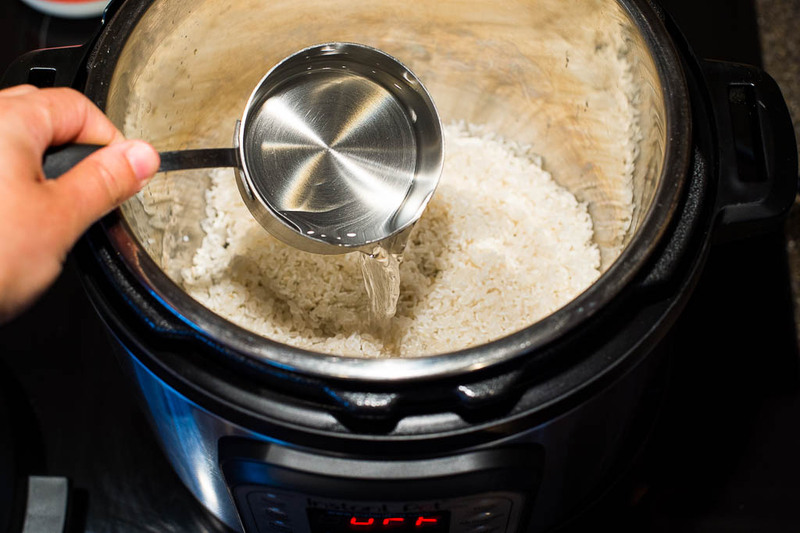 Place washed rice in the Instant Pot. Add 1 cup of water and 4 cups of milk into the Instant Pot. It is important that you keep this ratio. 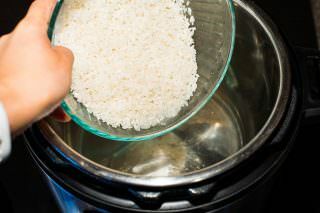 This ratio of liquid to rice will ensure the rice cooking well, without burning the bottom and you will have a little extra liquid leftover. Water also helps the rice from sticking to the bottom of the pot. Stir ingredients together. DO NOT add sugar at this time. Adding sugar while rice is cooking will burn the bottom of your Pot. Before you close the lid of the pot, make sure the silicone ring is nice a snug inside the lid. 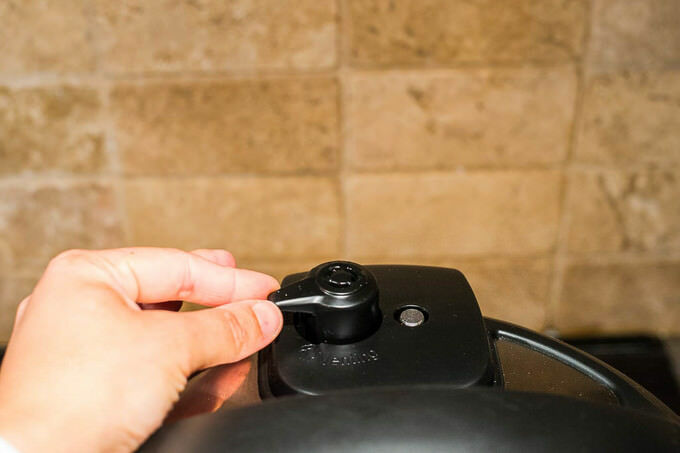 Set the Instant Pot to MANUAL and adjust the PRESSURE to LOW. Set the timer to 15 minutes. Close the lid of the pot and lock the pressure latch. Once the time is up and your IP is beeping, turn OFF the system. Slowly turn the pressure latch towards venting. However, do not vent it right away. Keep on holding the pressure latch between lock and venting. This is done to avoid foaming of the milk through the valves. Trust me, it will save you a lot of mess. You can do a natural release after turning the IP off. It will just take a little longer. Once the lid is open, stir the pudding. 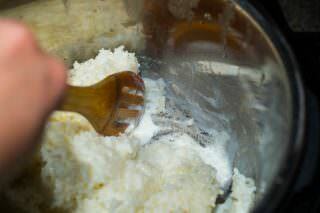 If you followed the recipe and used the same rice, the bottom of the Pot will be clear. 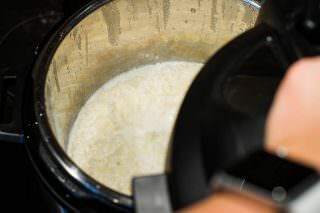 Add remaining 1 cup of milk and 1/2 cup of sugar. You can most certainly use less sugar if you wish. Stir ingredients together. Add butter to the pudding and mix it well one more time. At this point, your pudding is fully cooked. If you would like to add other spices or dry berries, this is where you would do so. My kids enjoy rice pudding with just a little more butter. 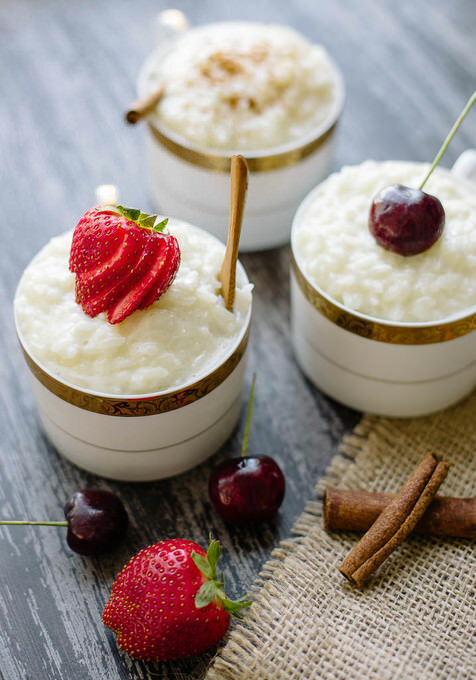 I hope you will give this Instant Pot rice pudding recipe a try. Let me know if this recipe worked out for you and if it didn’t we will get to the bottom of why it didn’t. optional additions: Cinnamon nutmeg, dried berries, etc. Add butter to the pudding and mix it well one more time. At this point, your pudding is fully cooked. If you would like to add other spices or dry berries, this is where you would do so. My kids enjoy rice pudding with just a little more butter. 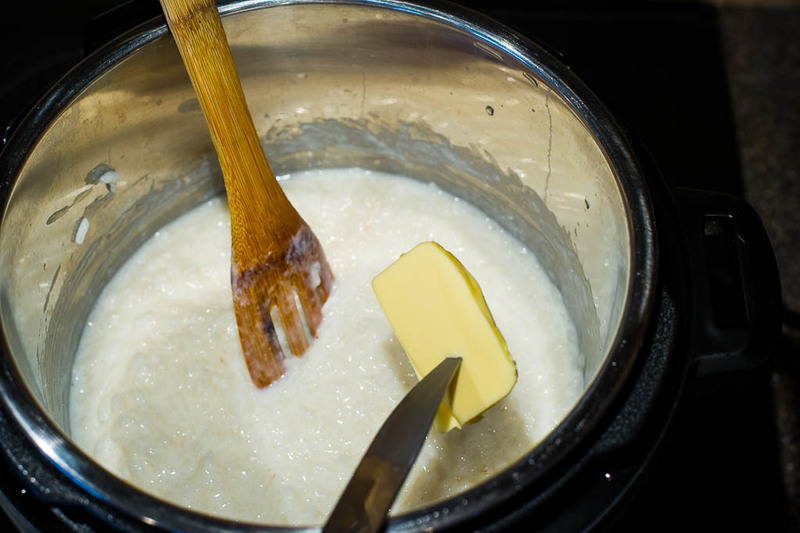 Did you try a porridge function for the Rice Pudding? You can definitely use prodigy function. I just like using manual in order to control the time depending on the volume of the ingredients. Tried this recipe using my new StirMate that I got recently. Stirring was super even and the recipe turned out perfectly! Hi Kiel! I am so, so happy it turned out well. I always worry that things may not work out for everyone. For that reason, I measure and re-measure ingredients all time time. However, things might go wrong sometimes. Comments like yours put my mind at ease. Thank you again! Hi Lori! You could definitely give it a try. I sometimes go with smaller batches of things.